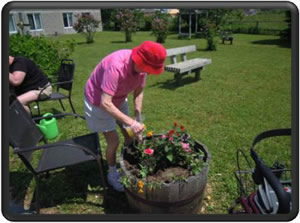 The envy of any Activity Club The Collingwood Nursing Home strives to give our residents a wide variety of programs and activities, that not only keep the young at heart active, but offers a supportive environment for those who want as little, or as much activity in their lives. Our list of activities are extensive, and we welcome and encourage new ideas for events and activities. Our exercise programs are both fun and comprehensive. Outdoor events include shopping excursions; visits to the library; beach; museum; or an outdoor barbecue. There are crafts and games for those with hobbies, as well as space for individual projects. For residents who are ‘green fingered’ or simply enjoy nature, there are a variety of indoor plants and an abundance of out door garden space. One-to-one visits; group discussions; music therapy; and pet therapy are also offered. There are Family Care Conferences that are designed to help us focus on the resident’s quality of life, provide the opportunity for their family and/or substitute decision maker’s to communicate their input and choices. This enables an open flow of communication between the staff of the Home and the key decision makers.